Tagged under Masami Kurumada, Toei Animation, Saint Seiya (Meta), Series. Over 2000 years ago, the Universe was formed from the power of Gods. To protect mankind, the goddess Athena assigned the power of the stars in the bodies of chosen humans called "saints". In Japan today, a young princess named Saori is proven to be the reincarnation of Athena. She will face her first test against evil when the world suddenly collapses, as it appears that one of her own men has planned a coup d'etat. In her attempt to fight against the rebel, she calls upon her remaining Saints. One of those who answers is Seiya, the incarnation of Pegasus. With the help of Hyoga, the incarnation of Cygnus, Shiryu, an incarnation of Dragon, the gentle-hearted Shun -- incarnation of Andromeda, and his brother Ikki, the incarnation of Phoenix, the six of them set on a journey to Athens, Greece, to put the world back into order. Saint Seiya character classes: Bronze Saints, Corona Saints, God Warriors, Gold Saints, Greek Gods, Mariners, Silver Saints, Specters, Steel Saints. A lot of this is talked about in the other topics. It was very original for its time (you can't considerit sentai, there's too many dang suits and it's shounen, sure, but there's some love stories in it), and a few things copied it (or B'tX, in which case sometimes it seems like Kuramada copied himself) There is humor, it doesn't abound and it depends on where you are in the story (more humor is found at the beginning of the whole series and Kiki provides a lot in Poseidon), but you don't always need to laugh. I will again say, I enjoy it, but I do consider it a guilty pleasure of mine even within the anime world. If you like Dragonball Z, Yuu Yuu Hakusho, Yoroiden Samurai Troopers (Ronin Warriors), or even crazy Greek mythology, give this a whirl, I think you'll like it. I like this serie of anime, is exciting! I really like the way Greek mythology is tagged herself there. I also want to give credits to the plot because it is a classic and interesting anime. 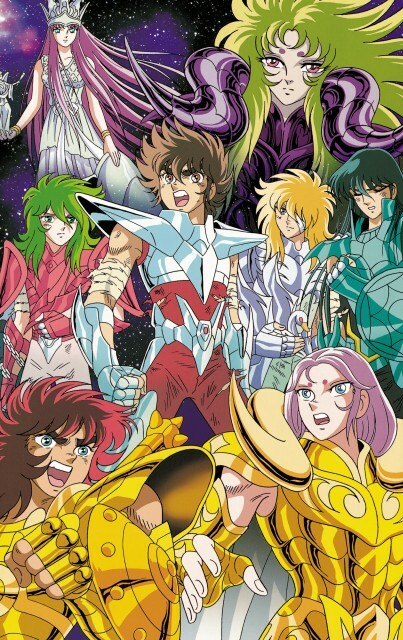 I'm a big fan of Saint Seiya classic (The one with 114 eps and the Hades Saga), but the merit I see in the series is the quality of the characters, they all are captivating even if the plot isn't really profound (you know, a fight that goes for two chapters, character nearly dies, but develops a new trick/level of cosmos and manages to keep going only to start the cycle all over again) and judging by the level of details it should be a masterpiece, so that's why I give it a 7.5. I also own the manga, Kurumada's art is very detailed if a bit static to my likings, but is still worth buying cause in the manga we have more depth in everyone's personalities and the plot. Also I love the way he draw with Araki style, everyone look so pretty, and the coolest part is super complicated cloth he draw! You will surely think this anime aged quite badly. But if you take a closer look, you will discover an impressive story.